If an individual trustee is subject to litigation, their personal assets may be exposed if their right of indemnity against the SMSF is not sufficient to discharge the liability. However, if a corporate trustee goes into liquidation, only the company’s own assets are at risk while the fund’s assets are afforded greater protection against creditors. Individual trustees do not have to complete ASIC forms in the event of a change in the fund and membership, nor ongoing ASIC annual reviews as corporate trustees do. A corporate trustee also has to ensure that it complies with both the constitution of the company and the requirements of the trust deed. While individual trustees also have to adhere to the requirements of their trust deed, they have fewer procedural issues to consider as there are more flexible requirements for holding trustee meetings. The fund can be less costly to establish if you are an individual trustee as you don’t have to set up a separate company to act as trustee. The average establishment fee for an individual trustee is significantly lower than that of a special purpose SMSF trustee company. While establishing a company will be a substantial expense at the start, it will not be a significant ongoing cost. What’s more, ASIC’s annual company review fees are reduced for companies whose sole purpose to act as a trustee of a regulated superannuation fund. Both individual and corporate trustees have to lodge an SMSF annual return and pay an annual supervisory fee to the ATO. On top of that, corporate trustees have to pay an initial ASIC registration fee and a lesser ongoing annual review fee to ASIC. Other annual costs for both trustees include optional financial adviser and accountant fees and the obligatory auditor fee. Both trustees have to appoint an independent approved auditor to audit the fund each year. Can I change my current SMSF structure? However, you want to remember that as with any change, you will have to amend the trust deed, report the change to the ATO and transfer all assets into the name of the new trustee. 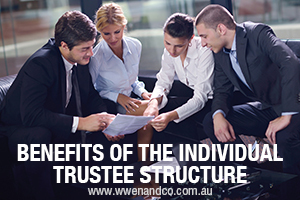 Read part 1 of our SMSF trustee structure here. Regardless of what trustee structure you choose, it is crucial you remain compliant. Talk to your tax consultant if you need guidance. SMSF challenges? Please contact the chartered accountants at our Epping office to help identify the best SMSF structure for you.